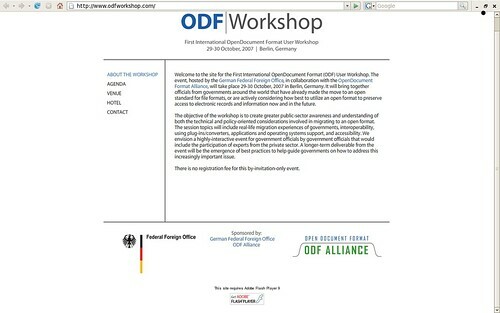 This morning Tamal-da (Sen, of WEBEL) mailed me in all urgency about his immediate trip to Berlin tonight to attend the First International ODF User Workshop in Berlin to be held on 29 - 30th Oct, 2007. The objective of the workshop is to create greater public-sector awareness and understanding of both the technical and policy-oriented considerations involved in migrating to an open format. I wonder since when did Adobe Flash become exactly an “Open Standard”? You are currently browsing the archives for the Slightly Disgusted category.